The Dutch Government proves again that they see Architecture as one of NL’s marketing-worthy assets. The Royal Dutch Mint has released 10 and 5 Euro coins displaying the names of important contemporary and historic architects, as well as some of their publications. Not buildings, these seem to be reserved for bills. The decision to focus on theory, not practice, ties in with the generous funding Netherlands supports architecture publications with. The ease to shell out books contributed to the ‘Super-Dutch’ era in the 90ies. 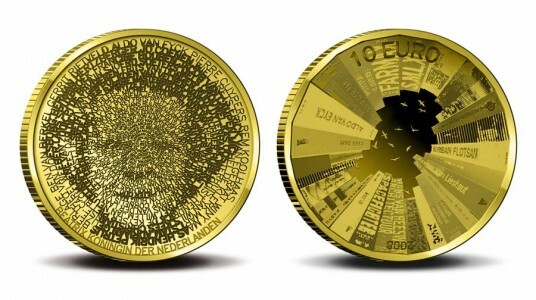 he Architecture five-euro coin was designed by artist Stani Michiels (b. 1973). The design on the obverse of the coin pays tribute to the history of Dutch architecture, with the portrait of Queen Beatrix being distinctively constructed using the names of important architects from Dutch history. The artist used the internet as a popularity-meter to determine the names’ order of appearance. You can buy it in the Mint’s coin store.